I use Facebook ads a lot. And each time I run an advert campaign, I get better results. I learn something new. Today I thought I’d share some of my successful methods with you. First, you need to set a specific goal. 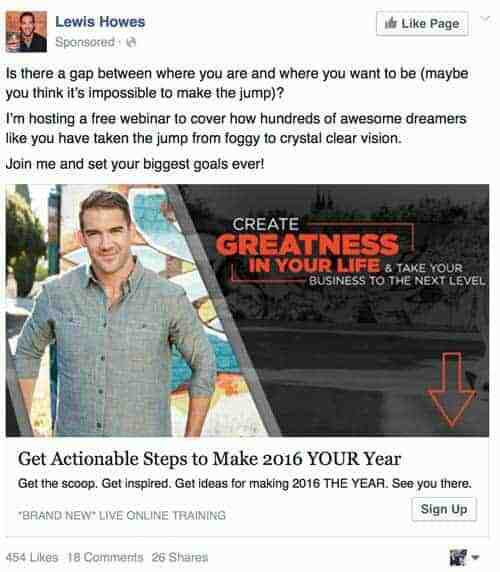 Be very specific about what you want to achieve from your Facebook advert. Is it to boost sales? Then choose a specific product to focus your attention on. As you can see in the image, this retailer has chosen a very specific item to advertise on my timeline. Don’t just drive people to your website. Drive them to a particular item or product. It makes it much easier to target the right people. That means a higher click-through-rate, and better conversions. Facebook is in the truly unique position to target users based on their likes, dislikes, and demographic information. Facebook collects all this data, and they use it to target adverts at us. It’s great news for advertisers and businesses. It means you can choose exactly who gets to see your promotions. 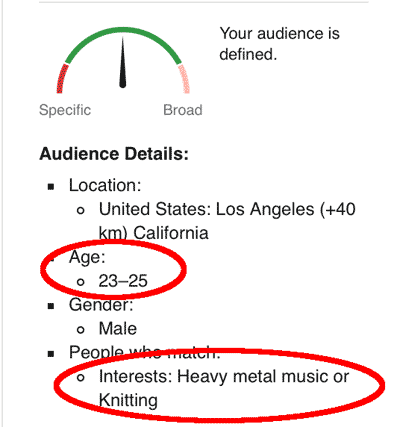 You can make your ads display to 23-25 year old men who like knitting and heavy metal music… (Now that’s a niche market). The more targeted and specific your audience, the better your click-through rate. Think about it. People are much likely to click on your advert if they’ve already been on your website. They already recognise your brand name. They’re already interested in what you’re saying. 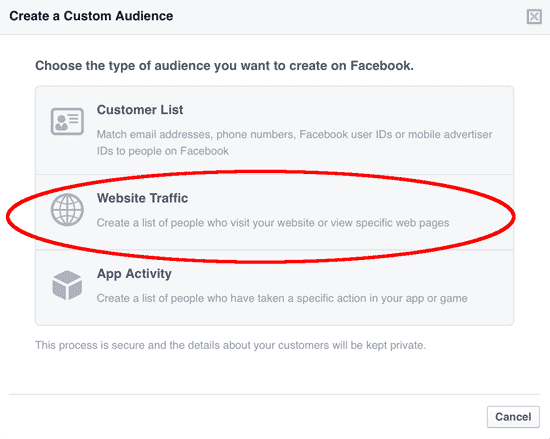 With Facebook you can choose to send adverts only to those who have visited your site. Here’s how it works. First of all, make sure cookies are activated on your website. 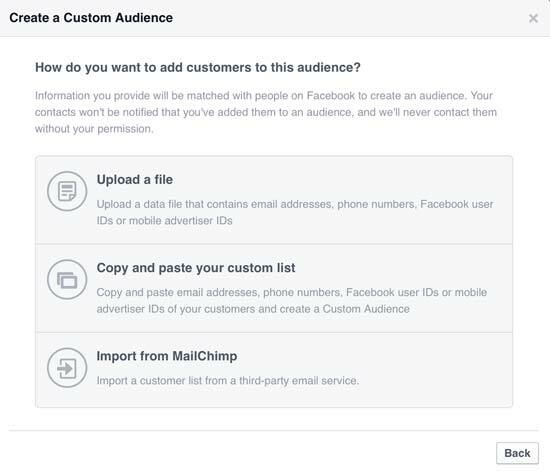 Now, when choosing your target audience, click the ‘Create custom audience’ button. It’s a great way to establish your brand, and build awareness. Since they’re already familiar with you, your click-through-rate will shoot up. The subscribers on your email list are also already interested in your business. If you’ve read my ‘sales funnel’ post, you know that you need to keep nurturing your email subscribers. With a little extra work, you can turn them into full, paying customers. One way to do that is by promoting Facebook adverts onto their feeds. Sure, you could email them, but this is all about brand awareness. They’re already used to seeing your messages in their inbox. Dropping your name into their Facebook feed gives them another gentle reminder. Again, you’ll find this on ‘custom audience’. Now, simply upload a CSV file, paste in the addresses manually or use your MailChimp account. 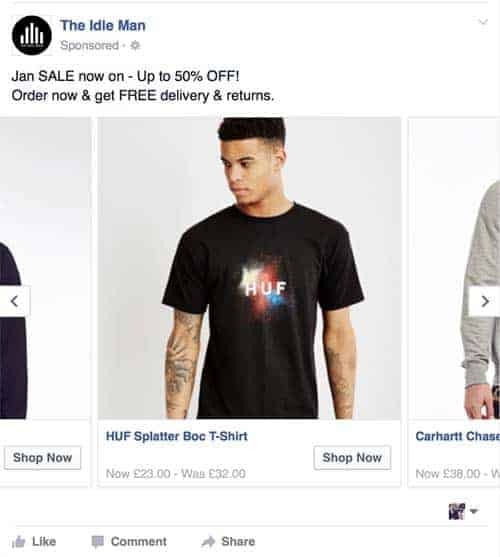 Facebook will search for those users in its database, and serve adverts to them. Think about how you and your audience use Facebook. We don’t go on there to look for products and sales. We’re on Facebook to enjoy content. We’re looking for videos and blogs. Instead of flooding people’s feed with adverts, give them what they want. Give them content! Create an outstanding piece of content, and make that your focus. Get that first click-through, and think about selling to them later. This marketer, for example, isn’t trying to sell you anything. He’s just introducing you to a webinar. It’s a cool piece of content to get you in the door. Make sure the title is teasing and intriguing. And make sure it aligns with your target audience. This technique will send your click-through-rate through the roof. You can worry about selling to them once they reach your site. Remember, 96% of people aren’t ready to buy from you immediately. So putting a product in front of their nose won’t always work. This is all about nurturing leads. It will give you a delayed return on investment, but it’s a stronger long-term strategy. But, what if you want an instant return on investment? It is possible to set up an advert that pays for itself in one push. To do that, you’ll need an incredibly effective landing page. Sending visitors to your usual sales page isn’t going to cut it. Your custom landing page gives people a reason to buy the product. 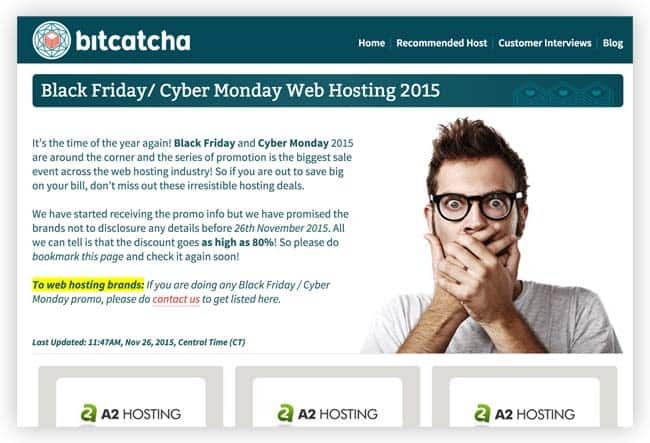 We recently created one here at Bitcatcha for our Black Friday sale on web hosting products. We could have sent people to our home page and let them figure it out. Instead, we built a highly targeted and persuasive sales page. When it comes to your advert, give people a very specific reason to click on the link. When it comes to sales, it has to be targeted, and exact. People scroll through Facebook fast. Really fast. We only stop when something catches our eye. Think about how you use your timeline. You scroll and scan until you see something you like. Your headline copy is the main way to connect with people. To stop them in their tracks, and make them take notice. The trick is to be bold, simple, and direct. You haven’t got time to be funny or clever when it comes to Facebook ads. Short, sharp sentences, and lots of keywords are all you need. Take Shopify’s latest ad for example. 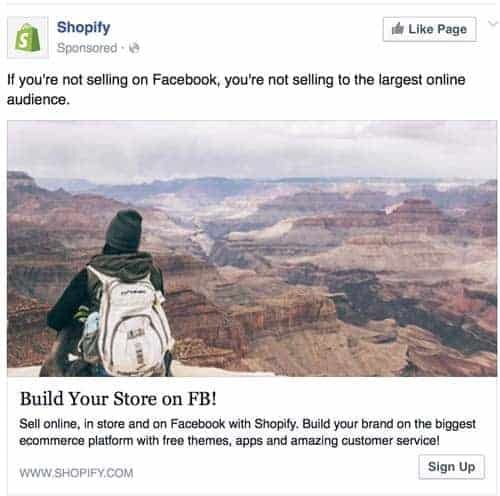 Their headline is simple, and direct: Build Your Store On FB! But make persuasive. Make it compelling. Facebook’s algorithm is carefully tuned to prioritize photographs. Recently, it tweaked that algorithm to super-prioritize video. Use a video as your advert, and you’ll boost your chances of getting seen. The human eye is much more likely to stop on a piece of video content too. 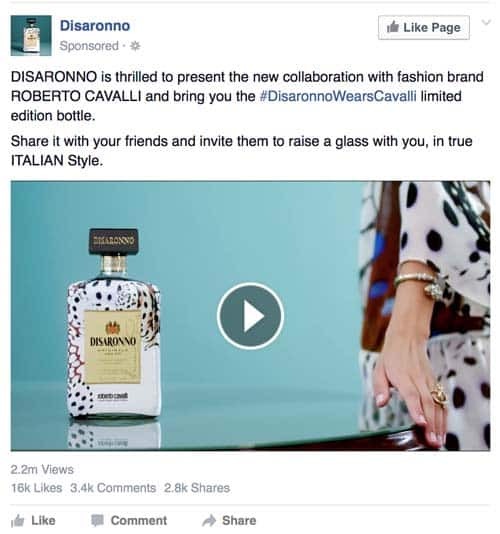 Check out this advert by Disaronno. They don’t even ask you to buy anything. But, with 2.2 million views, it’s reaching their audience! Focus on capturing attention first, then drive the click-throughs. Not even the smartest marketer in the world knows for sure what wording, images, or audience is going to respond better. A/B splits, however, can text tell you exactly what is the most effective. I use Adespresso to run my A/B splits. It clearly tells me what’s working, and which of my ads gets the best click-through-rate..
A/B tests are all about pitching two adverts against each other. Each one will be slightly different, and sent out to a sample of your audience. Facebook will then tell you which one had a better click-through-rate. You can try two different titles or headers. Try two different images or two slightly different audiences. The one with the most click-throughs is the one you put your full marketing weight behind. 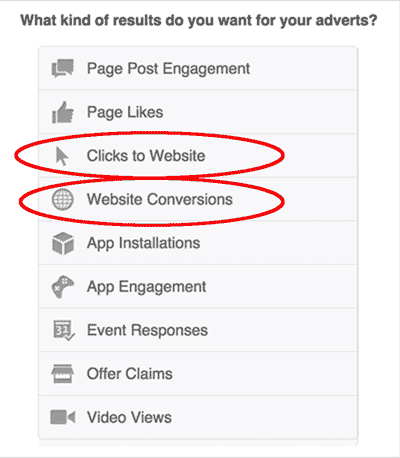 Facebook adverts can pay for themselves if you get the click-through-rate perfect! Let me know if you’ve got any burning questions about your Facebook adverts. I’m here to help, and would love to hear about your own campaigns!